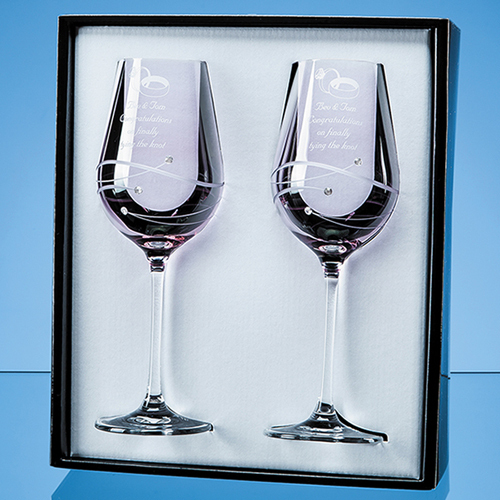 A stunning gift or memento of a special occasion such as a wedding, engagement, birthday or anniversary, these two elegant, long stemmed wine glasses have a romantic pink tint to make them extra special. And with a delicately etched spiral cut design and three sparkling Swarovski Diamante crystals placed along the swirl they will add a touch of glamour! There is an engraving space at the top of the glass where a date, names, inscription or message can be added. They are packaged in a beautiful presentation box.